YouTube managers officially announced on Monday a new initiative that will see thousands of major Hollywood studio films available for rent from the site, in an attempt to challenge Apple's share of the Video on Demand market. Starting on Monday and rolling out over the coming weeks, blockbuster releases such as Inception and The King's Speech will be available for rent at "industry standard pricing" at youtube.com/movies, Google's YouTube Product Marketing Manager Camille Hearst and Product Manager Matt Darby confirmed in a blog post Monday. According to the post, many movie pages will feature YouTube Movie Extras, such as free behind-the-scenes videos, cast interviews, parodies, clips and remixes from contributors, as well as reviews from Rotten Tomatoes. Earlier in the day, the company teased the new mainstream movie rollout, noting that it had begun adding 3,000 new movie titles for rent. In addition to content from major movie studios, YouTube is sponsoring original independent content through several initiatives, such as the YouTube Creator Institute and YouTube NextUp. Reports emerged late last month that YouTube had reached agreements with most of the major studios, including Sony Pictures Entertainment, Warner Brothers and Universal, to begin offering movie rentals. However, Disney, Fox and Paramount have reportedly passed on the deal over concerns that Google has "not taken adequate steps to stop supporting piracy sites." Google, which acquired YouTube in 2006 for $1.65 billion, first began offering movies for rent on the site over a year ago, though initial offerings were limited to mostly independent movies. 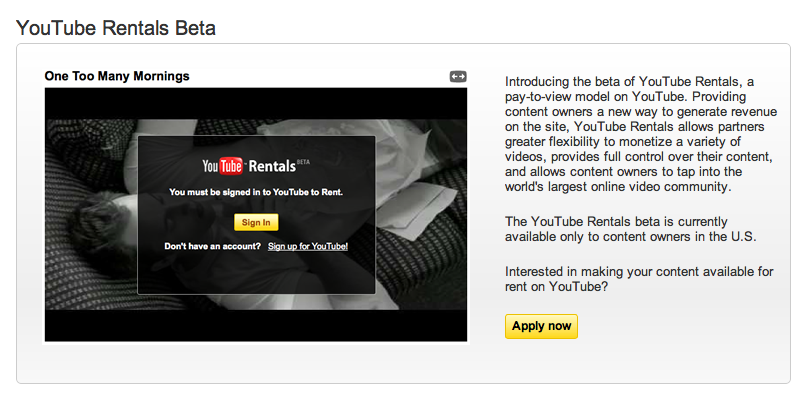 Earlier this year, the company began experimenting with a beta YouTube Rentals program for publishers. 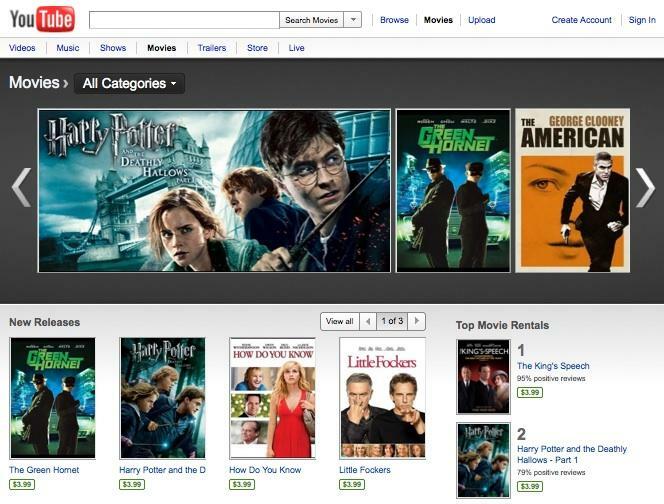 Apple has offered iTunes movie rentals since 2008 and began renting out TV shows last year. In 2010, the company held 64.5 percent of the Video on Demand market, according to research group IHS. Other competitors in the VOD industry include Microsoft, which captured 17.9 percent of the market last year, Sony, which grabbed 7.2 percent, and Amazon.